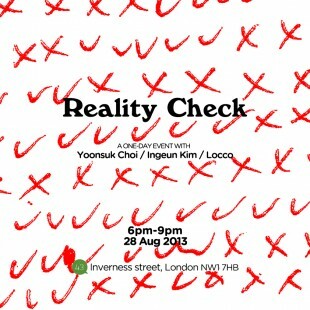 43 Inverness Street is pleased to announce Reality Check, a one-day event presenting artworks that involve sound, performance and installation on 28 August with artists Yoonsuk Choi, Ingeun Kim and Locco. A ‘reality check’ is normally thought of as a confrontation with reality as it actually is and not how it is perceived. The three works in Reality Check question our perceptions of reality. In their diverse approaches, they contemplate how we understand the world around us by playing with notions of the uncanny. The half gallery and half home environment of the space at 43 Inverness Street is a perfect location for these works and emphasizes the habitual gestures of the everyday and interweaves concepts of familiarity and unfamiliarity. Yoonsuk Choi’s performance piece Soapbox where I can shout it takes place on the ground floor on a stage where the artist conducts an auditory experiment by playing recorded sounds gathered from commonplace experiences to the audience. Choi uses a sound looping device that musicians use called Loop Station which enables sounds to be recorded and then repeated on its own. By playing back these familiar sounds, the artist is curious what kinds of associations the sounds trigger in the audience. The playback of familiar words and sounds brings unfamiliarity to the collective experience. Ingeun Kim’s sound installation work Throat plays with the idea of the fabrication of habitual and familiar noise in post-sound production and consists of recordings that focus on the ambiguous, uncanny and illusionary aspects of the sonic experiences that he encounters in his surroundings. He has recorded mundane noises (such as a whirring fan or the rubbing of fabric) and manipulated them in post-production to the point where the edited sounds seem like they reflect memories of his experiences. The narrative is built around the core of the piece which is identifiable by the reproduced sound of a dog’s deep growl that stems from the artist’s recollection of an occurrence in the park. In his mixed media work An Abstract Journey displayed on the first floor, Locco shares his walking journey from his studio/home in Southwark to 43 Inverness Street. Using the canvas and his admiration of spontaneity, he collected abandoned items on the street that he found along the way and assembled them in the gallery by fixing the pieces onto the canvases. In addition to the canvases, a shopping basket filled with found objects is installed in the room. Amongst the items in the basket is a small screen that shows video footage of the journey.